Drake's Flames: Tiny Game Review - Galapa Go! So much for the afterglow. Monday I reviewed Risk Legacy, a game that I am still thoroughly enjoying and cannot wait to play again. To temper the excitement of that incredible game, I've decided to flip it backwards and review a game that I hope to never play again, ever. 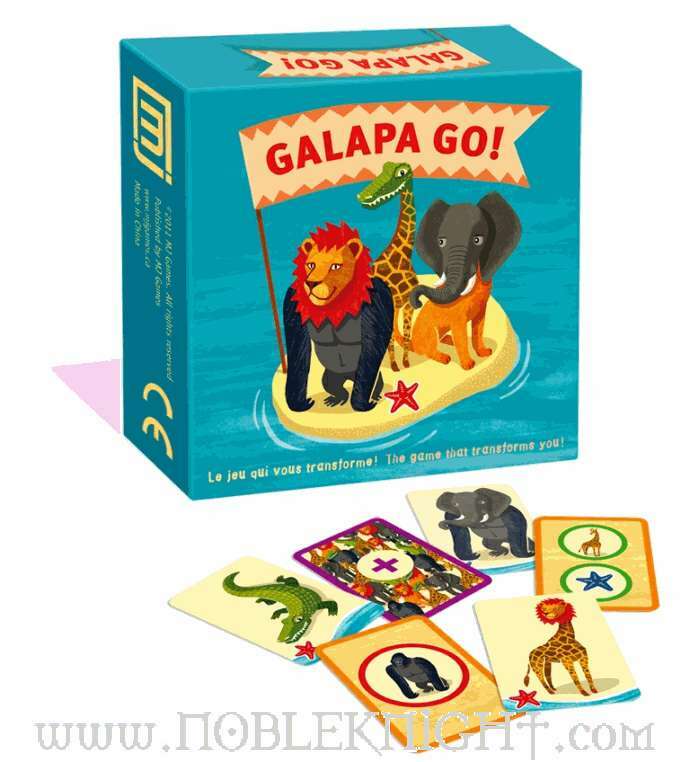 That game is called Galapa Go! It's one of those unfortunate games whose titles end in exclamation marks, which I find terribly irritating. However, I am more than willing to forgive the inopportune punctuation if the game is good. Since Galapa Go! is not very fun, I have chosen to criticize the game for its title. I will also criticize it for being boring. The game is cross between a matching game and spoons. There will be a bunch of cards on the table, showing pictures of various animals on tiny islands. There are regular animals like gorillas and elephants, and then there are mutant animals, like gorillas with elephant heads. Then you'll flip a card that will tell you if you should be hunting giraffes, or making sure you don't get any blue starfishes. Then there's a madcap race to put your island card on top of a card that fits the bill. "OK, so, no giraffes or giraffe parts. And you have to have a red starfish. And he can't be a mutant, so no lions with gorilla heads. And - hey, wait till I finish! Dammit!" It's not that Galapa Go! is some really horrible game. If I were eight years old, I would probably want to play Stratego with my dad again, because I got bored with Memory when I was four, but maybe somewhere, there are young kids who would like this. My point is, it's not horrible. It's not like there are giant flaws in the game, or misleading rules, or confusing imagery. It's just not really very interesting. We got bored of playing the game after we read the rules, and by the time we finished our first game, we kind of quit paying attention and started talking about consuming rubbing alcohol. I will say that if I had a classroom full of snot-dripping third-graders, I would probably stock Galapa Go! so that I could distract them long enough to flirt with the cute, recently divorced art teacher down the hall. I can see how you could say Galapa Go! is good for developing quick logic skills or teaching kids to pay attention or something. Maybe that's why I didn't like it - it was almost educational. It was certainly boring enough to be educational. So here's some advice - don't get Galapa Go! unless you have a regular need to entertain children who are easily distracted. Instead, play Risk Legacy! Oh, wait, that's not out yet. I don't know, go outside or something.